A man held a sign during Saturday’s rally at the State House. DOVER, Del. — Gun rights supporters — many carrying rifles and ammunition — gathered at state capitols across the country on Saturday to push back against efforts to pass stricter gun control laws that they fear threaten their constitutional right to bear arms. From Boston to Wyoming, hundreds gathered at peaceful protests to listen to speakers who warned that any restrictions on gun ownership or use eventually could lead to a ban on gun ownership, which is guaranteed under the Second Amendment. ‘‘If you have a building and you take a brick out every so often, after a while you’re not going to have a building,’’ said Westley Williams, who carried an AR-15 rifle as he joined about 100 people in blustery weather in Cheyenne, Wyo., for a gun-rights rally in front of the state Supreme Court building. Saturday’s protests were planned in dozens of state capitols less than three weeks after hundreds of thousands of people marched in Washington, New York, and other cities to demand tougher gun laws after the February school shooting in Parkland, Fla., that killed 17. Organizers of those protests demanded a ban on assault weapons and high-capacity magazines, and called for universal background checks on potential gun owners. In Boston, 75 progun activists gathered on the steps of the State House on Saturday afternoon in a show of solidarity on gun rights. 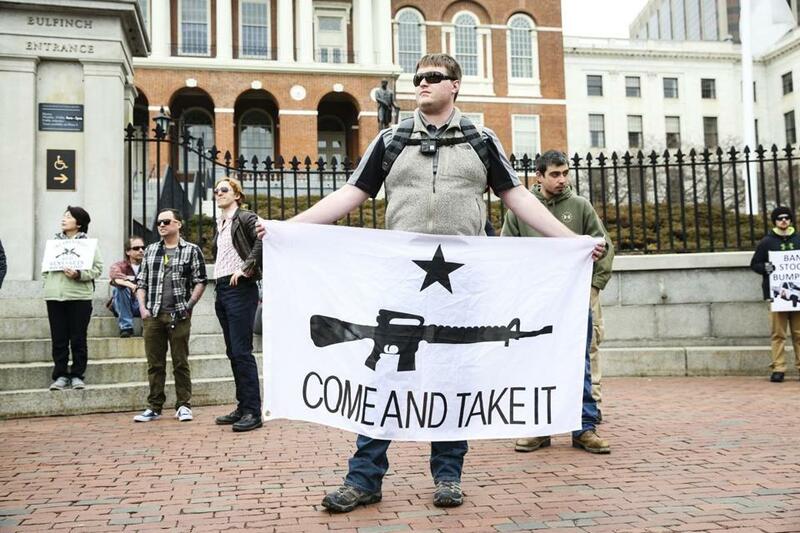 Members of the Massachusetts chapter of the Three Percenters, a national gun-rights movement, made up about two-thirds of the demonstrators who turned out in Boston. The group gets it name from the percentage of Colonists who joined the Continental Army during the American Revolution. The Boston rally had no set program, and some attendees seemed confused by the lack of organization. The crowd dispersed after about two hours. Two men spoke at the rally, including Scott Lively, who was an independent candidate for governor in 2014 and is running again this year. Another speaker, who identified himself only as Dave, urged the protesters not to give up their guns. During an Atlanta rally, more than a quarter of the 180 participants carried weapons, as well as flags and signs saying ‘‘Don’t Tread on Me’’ as they listened to speakers talk about the right to bear arms. A few people wearing ‘‘Black Lives Matter’’ T-shirts showed up at the Atlanta rally and made videos, but didn’t interact with the participants. The Three Percent movement is made up of groups who vow to resist any government that infringes on the US Constitution. Such groups generally lack the following of more mainstream Second Amendment advocates, such as the National Rifle Association. A group called the National Constitutional Coalition of Patriotic Americans spread word of the rallies on social media. Coalition cofounder David Clayton said a new gun law in Florida and similar measures being considered in other states threaten the rights of law-abiding gun owners. Nikolas Cruz, 19, is charged with killing 17 people and wounding 17 others at Marjory Stoneman Douglas High School in the Feb. 14 mass shooting in Florida. He faces the death penalty if convicted. Howard Finkelstein, the chief public defender in Broward County, has said Cruz intends to plead guilty if the death penalty is waived. Globe correspondent Martha Schick contributed to this report.